In a complex finish into Tours, France, Marcel Kittel of the Agros Shimano team took the win away from Mark Cavendish as they battled it out to the line. It really looked like Omega Pharma Quickstep’s Cavendish would win the final sprint, but he may have been delivered a little too early by his lead-out man, Kurt Stegmans. That gave Kittel the opportunity to use Cavendish’s slipstream and then come out to beat the Manx Missile to the line, which he barely did by a wheel length. If only Cavendish had thrown his bike–he looked sideways to see Kittel, but it was too late. Kittel was all smiles after his third stage win in the Tour this year. A crash less than 1 km from the finish took out most of the Lotto-Belisol team and their sprinter Andre Greipel, who weren’t there to compete. It was a quick end to a long day that saw a breakaway which formed at kilometer 8, stay away most of the stage. 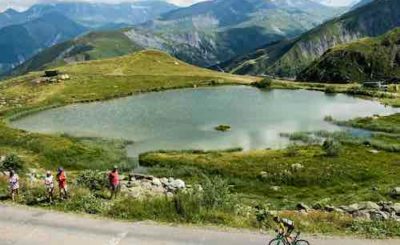 There were no hills in the 218 km stage from Fougères to Tours which would take riders through five departments – Ille-et-Vilain, Mayenne, Sarthe, Main-et-Loir, and Indre-et-Loire. 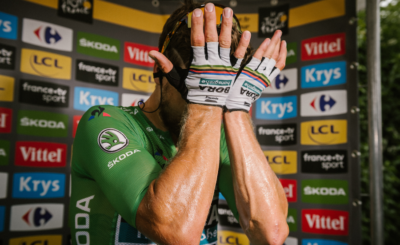 The consensus among experts was that the stage would end in a sprint, and that Cavendish, who has been much maligned since the shoulder “nudge” to Tom Veelers in stage 9, will not just be looking for a win, but will do everything he can to vindicate his loss and humiliation that day. I mean, come on, let’s stop re-playing that footage –enough already! But it wasn’t to be. This is the first Tour that Cavendish has raced in where he is being accompanied by his now-wife Peta Todd. You remember her? We introduced you to her several years back. Well, now they have a cute little girl, and she’s along for the ride too. That makes winning extra important. LeTour.fr asked the Olympic sprint champion from the London Games, Anna Meares, who she thought would win the stage.”Cavendish, Kittel, Kristoff, Goss and Sagan,” was her reply. Well, she was right about the top two, almost. Robbie McEwen was out on the course early this morning filming the last part of the course so that he could send it back to the Orica-GreenEdge team. The three-time winner of the Tour’s green jersey who retired from racing last year is now a consultant for the squad and he advises the riders on tactics. 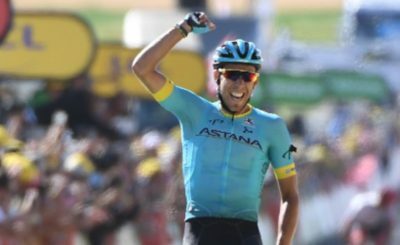 We’ve gotta get a stage win for Gossie soon,” he told LeTour.fr this morning while he was downloading files from a GoPro camera. “The road to the finish is fairly uncomplicated,” he explained while viewing the final kilometre. But his sprinter Matt Goss never got to do the sprint because one of their riders was taken out early in the lead-up to the finish, when he slid out in the first sweeping turn. And so it was, every team with a good sprinter in the ranks was aiming for the finish in Tours. Early on in the stage, five men started a break and they were already 1’45” at 8 km from the start. At 31 km the leaders were ahead by 7’20”, and included Romain Sicard (FRA) EUS, Francesco Gavazzi (ITA) AST, Anthony Delaplace (FRA) SOJ, Manuele Mori (ITA) LAM, and Juan Antonio Flecha (ESP) VCD. Coming into the stage, Movistar continued to lead the team classification with an advantage of 4’34” over Saxo-Tinkoff. There were three from the leading team in the top 10 of the overall rankings: Valverde (2nd), Quintana (8th) and Rui Costa moved up from 9th after the time trial. Soon, the pace of the peloton has picked up a lot and the advantage of the escape has dropped to 6’50”. A fall in the peloton with Alexandre Geniez (FDJ) and Blel Kadri (ALM) occurred when the peloton was 6 minutes and 15 seconds behind the leaders. The advantage slowly came down. At 80 km to the finish, Omega Pharma-Quickstep, Lotto-Belisol, Argos-Shimano and Sky led the peloton as it slowly closed in on the escapees who were now ahead by 4’50”. As they approached 21 km to the finish, there were only four riders ahead, and that included DelaPlace, Mori, Flecha, and Gavazzi with a one minute advantage over the peloton. Could they hold them off? With less than 15 km to go, Mori, DelaPlace and Gavazzi had been absorbed by the peloton, while Flecha stayed out in front. Flecha made a final attempt, establishing a greater distance ahead of the peloton by 15 seconds. A sprint finish was guaranteed. At 5 km to go, the peloton was together, and Orica GreenEdge was in the front, and then there was a crash of one in the team as they came around the corner. Their sprinter, Matthew Goss was in third place. With a little more than one kilometer to go, Peter Sagan was about third back. Two lead out lines were forming on both sides, Agros Shimano for Marcel Kittel was one, Omega Pharma Quickstep on the other side for Cavendish and then there was a big crash in the field, that included Philippe Gilbert, and a lot of Lotto Belisol riders. Tony Martin was near the front, as was Omega Pharma Quickstep’s Tony Martin, battling it out with Agros Shimano, Greipel was left behind in the crash, though Sagan was still in the bunch. Cavendish had a long lead out by Stegmans as they turned the corner, but Marcel Kittel followed Cavendish’s wheel and took Cavendish to the line.